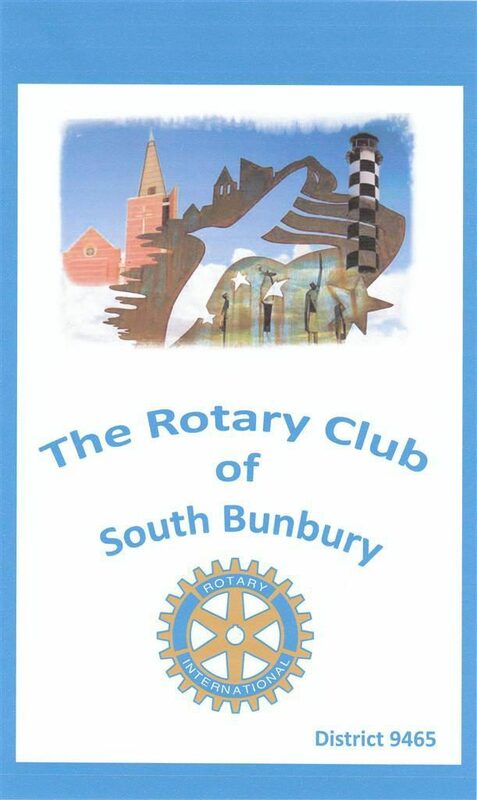 The club’s new banner shows a selection of local Bunbury images. The overall centrepiece is a steel plate sculpture opposite the Entertainment Centre. It depicts a bird (seegull) representing freedom and the sea; the Southern Cross stars; and a silhouette of our buildings, being the Bunbury Tower and Art Gallery. The lower foreground shows the central directional statues of the Koombana Drive round-about, including that Rotary assists the community in all possible directions. The lighthouse shows we are a coastal city. The new cathedral is present as an iconic building and can link its year of completion to the year of our new banner’s creation. The clouds indicate that Rotary rises above the clouds with its high ideals, ‘floating’ ideas for Service Above Self.